Happy Friday! Hope you all had a great week like the woman rescued by deputies in California. (What a public servant, right?) Well, whether you were stranded or the rescuer this week, it is FINALLY Friday. You made it! So, I hope you'll sit down with a cup of coffee/tea and enjoy this installment of "5 Things." 1) October is Breast Cancer Awareness Month and I just wanted to remind you, ladies, to get 'em checked! This year the need to be vigilant is even more present as two women in my life have been diagnosed in the past few months. It's a relief that they both detected cancer early and have an excellent chance of beating it. 2) I wanted to share a non-profit that is pretty incredible: Hearts to Nourish Hope is an Atlanta-based organization that serves the youth of the community and accomplishes some amazing things for the underserved. The group recently earned a Wells Fargo Neighborhood LIFT grant and made their debut on Twitter @NourishHearts. So, if you're on Twitter, I hope you'll give them a follow as well! 3) The Chronicles of Narnia are coming to Netflix. I am really curious to see what this looks like as translated by Netflix money. Time to read the books, again, before the series comes out. 4) This recipe looks so cool. I haven't tried it yet but it's on the list. The idea of reusing a Starbucks cup to eat chocolate is very appealing. 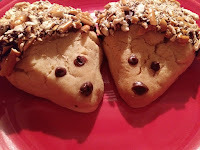 5) And speaking of recipes, these hedgehogs are way, too cute! My sister and I made them over the weekend and they turned out great. We did replace the crushed pecans with crushed pretzel sticks to make them nut-free. The saltiness with the sweet was a nice touch. Note: They are very time-consuming so an extra set of hands (or two) is perfect.